There have been a fair few bunny themed items of clothing popping up in highstreet stores recently but I have to say this is my fave. Just look at that cute little face! The style reminds me a little of the 'Primp' clothing line - anyone remember the brand. There was a period where you saw celebrities like Rachel Bilson and Paris Hilton walking around in thermal wear covered in bunnies, or snowflakes and sometimes even anchors! If you aren't sure what I am on about maybe this will jog your memory.. The jumper is a little oversized on me, because when it comes to choosing the right size for myself I can never get it spot on - But hey, it means if I shrink it I wont be upset that it no longer fits because it will end up being just right! 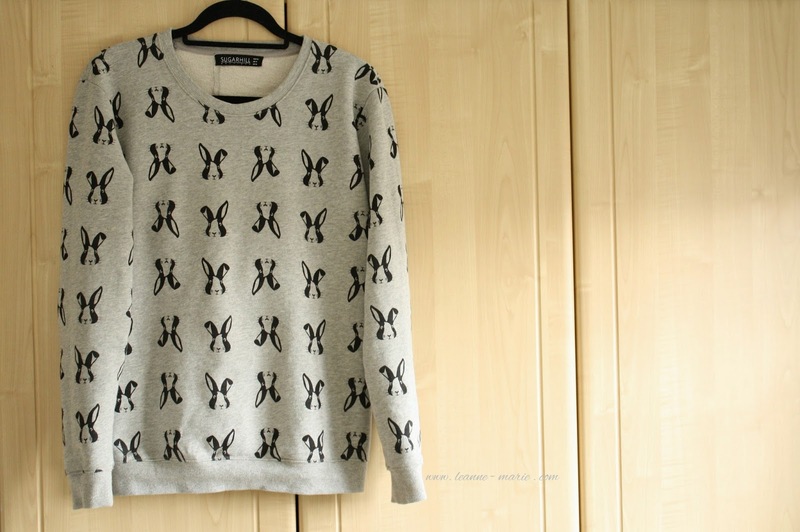 I love that it is a grey marl sweatshirt because I don't have many grey items in my wardrobe. Grey also goes with a lot of things so I'm not limited to what I can wear with it! The print is a sugarhill boutique exclusive and they also have a jumper with a large motif of the bunny which you can find here. As I said it is very appropriate for the upcoming Easter period, but I'll definitely keep wearing it throughout the year! What do you think of it? 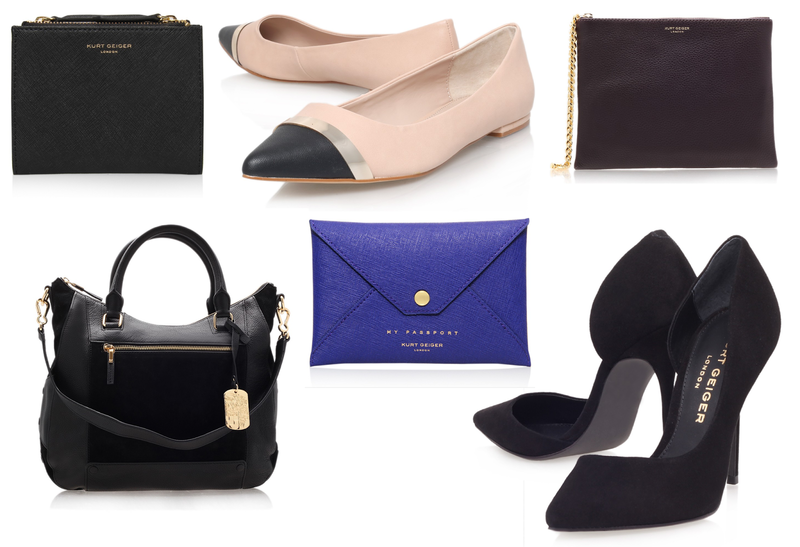 Have you seen any of Sugarhill Boutiques latest offerings? 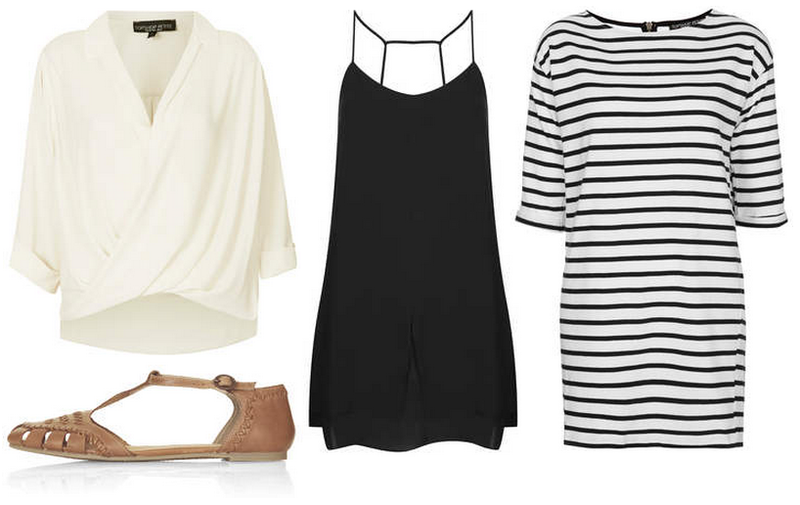 So there's a reason behind the fact that today's Saturday Spending post is Topshop themed. Today I am going to head along to the newly refurbished Topshop store in The Oracle in Reading to have a look around it and buy a few goodies. They have kindly gifted myself and Lorna (read her blog here) a voucher each to choose a few pieces to feature in a blog post. I would really like to start to build a basics/capsule wardrobe so I am hoping to use this opportunity to make a start on that! A lot of simple versatile pieces that will probably be down the monochrome theme in order to make the most of mix and matching outfits! Topshop do currently have sale one so I am hoping I can get a few bits with my voucher! Is there anything you currently have your eye on from Topshop? So before the weekend when I had a bit of a 'Okay I need to get back into serious saving mode' I was feeling a little worse for wear I may have placed a LookFantastic order. This order was in addition to a order I placed a couple of weeks ago which you may have seen pop up on my instagram and facebook page. I hadn't purchased any new hair care items for a while, in a bid to try and use up what I had. Once I knew I was getting my hair dyed I wanted to just have a complete overhaul and get some new products to use. Redken All Soft Supple Touch (£12.60) - This product was recommended by Mary. It is a leave in softening treatment which is suitable for dry hair. Used just like a leave in conditioner, you spray it on towel dried hair and style as normal. It's pretty ligthweight so doesnt weigh your hair down and leaves it, as the name suggests really soft. It contains argon oil and acts a little bit like a detangler so you can get your tangle teezer/comb through your hair with ease too, which is always a bonus for me! 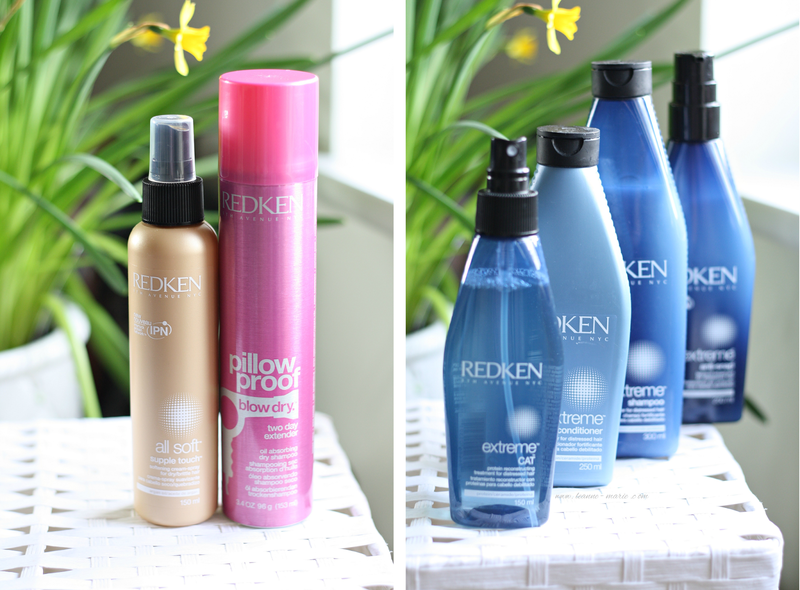 Redken Extreme Shampoo & Conditioner (£18.30) - I used to use this duo back in the day when I was really blonde (before I blogged!) and my hair was always in such good condition even though I was slapping the bleach on it on a regular basis!The extreme range is specifically for dry, damaged hair, and even though my hair isn't necessarily damaged at this moment in time it is quite dry so adding this duo into my routine every so often should help it stay well conditioned. Redken Extreme CAT Protein Treatment (£12.60) - I bought this more specifically to use a bit further down the line when I have had more blonde put in my hair. Bleaching takes out all the moisture in your hair so it's good to treat it to try to restore what is lost. That is exactly what the CAT Protein treatment does. You use it between shampooing and conditioning your hair. so it's one of those you can whack on while you shave your legs! It penetrates deep to build internal strength, reinforce structure of your hair cuticles and repair any damage the bleach has caused. A must have for bottle blondes in my opinion! Redken Extreme Anti Snap Treatment (£12.60) - The Anti Snap treatment is a very popular leave in conditioner that I have used before. As I bought the All Soft Supple Touch spray I probably didnt have to get anti snap but I couldn't help myself! It's great for reducing the amount of breakage you get from brushing through your hair, which happens often if you've bleached it as well as smoothing your ends. I don't plan to use ALL these products at the same time, but I'm pleased to have a selection of different treatments to use while I head on my journey for lighter hair! I'm sure you are all aware but your hair can get used to products and then they don't have as much as an effect on your locks, so it's always good to switch things up every few weeks! Yes I know, Wow.. I am rocking a very bold lip right here! 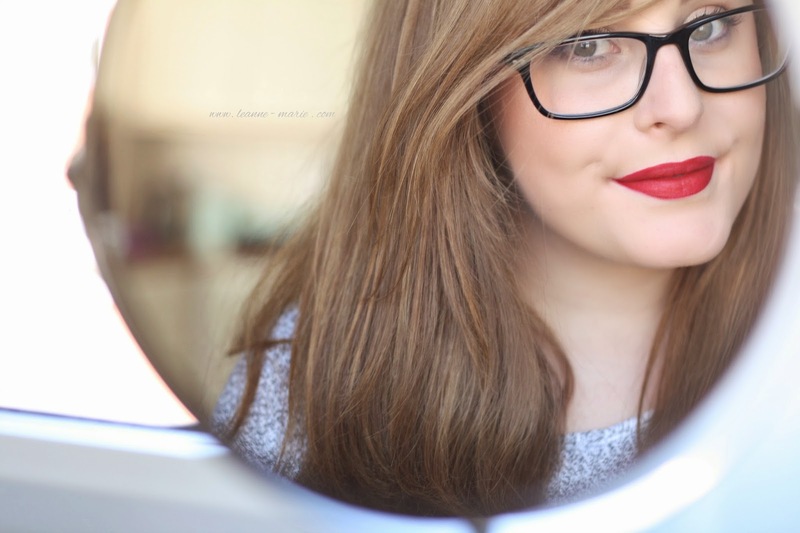 If you have been a long time blog reader you will know I don't usually venture down the bold bright lip path.. in fact it's pretty unheard of! However I discovered this lip product and thought... screw it let's be a little adventurous, I'll buy the red shade and see if I can rock it.... and I think I can? The product in question is a MUA Luxe velvet lip lacquer in 'Reckless' which retails at an affordable £3. There are five shades available, Kooky (deep purple), Criminal (very bright pink), Atomic (bright orange), Funk (deeper pink) and this one! I think I may be a little late to the party with these because I've heard that they are pretty hard to get hold of? Either way I managed to snap this up in my local Superdrug who had 3 of the 5 shades available to purchase. First off the pigmentation of this lip lacquer is absolutely amazing, I hardly need any on the doe foot applicator in order to get a good colour payoff. Be warned though, these definitely are not the type of product you can apply without a mirror. In fact it can get quite messy if I am honest. Due to the nature of the product the slightest wobble of the hand when applying will show up, so you can approach the application in two ways... either line your lips first with a co-ordinating lip liner and then use a small lip brush to apply the colour. Or you can just take baby steps to apply it using the doe foot applicator. I chose the latter of the two in this instance. I guess it depends on how steady your hands are when deciding which way is best for you. Once applied the product feels pretty wet and tacky, which I wasn't too keen on at first. However once you let it dry completely after a couple of minutes you are left with a lovely looking matte finish on your lips. Then it doesn't budge..... seriously. 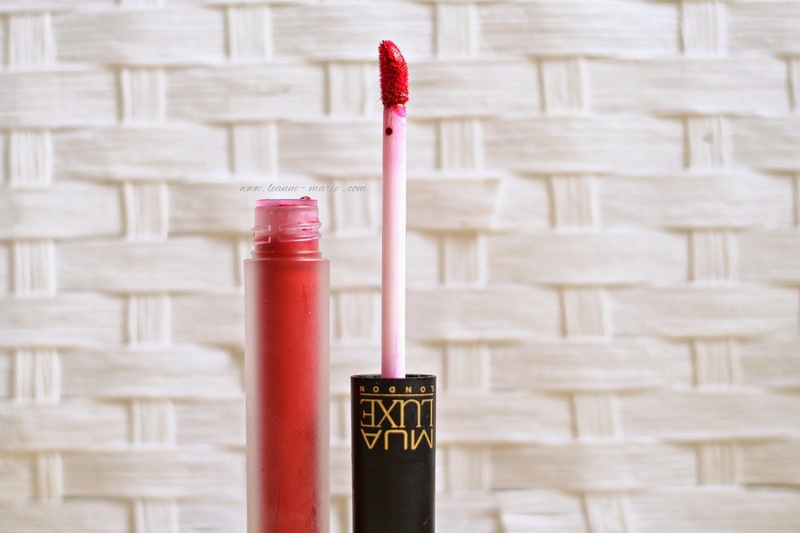 I applied this before eating some lunch, and after scoffing a sandwich alongside downing a massive glass of water, the MUA Luxe velvet lip lacquer had only faded slightly on the centre of my lips. I was seriously impressed! In regards to removing the product from my lips face wipes didn't really do anything, nor did miscellar water! - Well Miscellar water budged it a little but you would have had to really scrub to get it off! In the end I opted for a hot cloth cleanser to remove the lip lacquer & that did the job nicely. So in regards to pigmentation this gets a big thumbs up from me, application is a bit fiddily but once you've applied it a couple of times you get the hang of it. The staying power of this particular shade is brilliant, and at only £3 it's a product I would actually consider buying a back up of because I like it that much! I've had a look on some other blogs at the other shades in the range and I have to say that 'Funk' does catch my eye! One point that has been made on other blogs is that these are a good dupe for the Lime Crime Velvetines lip products. Now I don't have these to compare, but as it is something that seems to be said quite often I guess they must be correct! Have you tried any of these MUA Luxe Velvet lip lacquers? Which shade is your favourite? Ah Saturday spending is back - I went on a little break from this feature because frankly there wasn't much I was lusting after and I didnt see the point in just putting up a post for the sake of it! I was watching Fleurs 'Whats in my bag' video and noticed that she had a really nice small Kurt Geiger purse. I instantly fell in love. 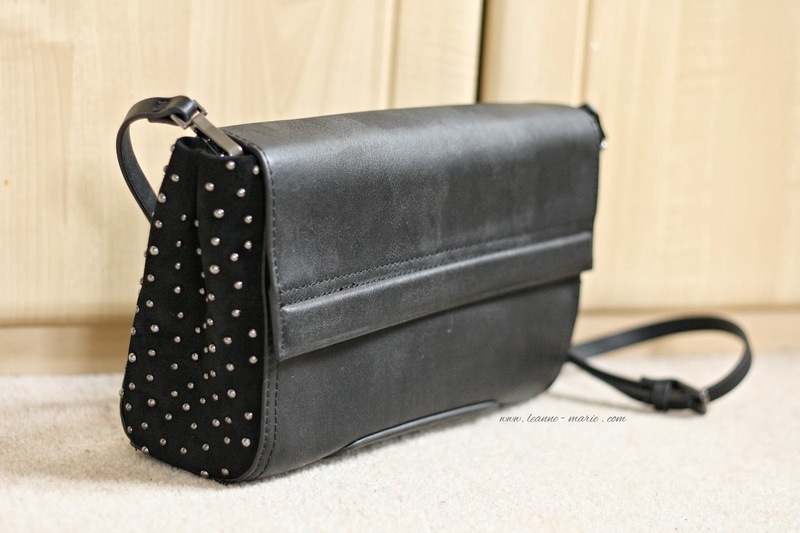 My current purse is Kurt Geiger and has held up pretty well over the years but it is very big and bulky, which isn't ideal when I want to use smaller bags! I decided to have a look at the website to see if I could hunt said purse down, and I did. (I think Fleurs is Pony Skin and this one is Saffino Leather) Obviously while browsing I came across some other bits I liked and had to throw them into the mix. To enable you even more (mwhaha) there is currently a 25% discount code floating around the interwebs. If you enter KGMARCH25 at the checkout it will amend your final total. This discount code is valid till the end of March! So I went ahead and treated myself to a bit of a pamper and got my hair done. It's been a while since I stepped foot into a salon for a bit of dye to be thrown on my locks. Ever since I went back to dark brunette I opted for the home dye kits. It was just cheaper and easier! This time though I decided I wanted to go a bit lighter so I decided to head along to LKHair and get Katy to work her magic on me. LKHair is a salon based in Newbury, Berks. 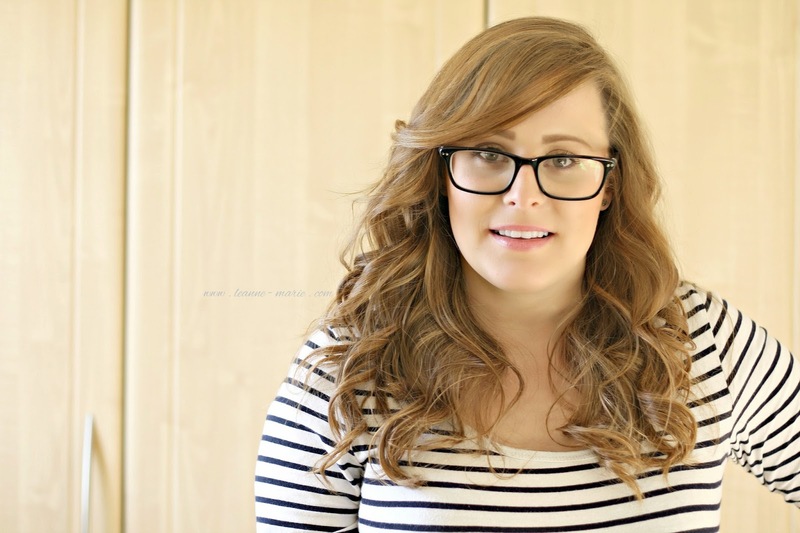 They offer a range of services; the usual hair cuts, colour & hair extensions. Holistic Beauty treatments as well as Nouveau Lash extensions, HD Brows, Nouvoutan spray tans & Biosculpture gel nails. Basically if you want to give yourself a bit of a pamper you can go along to them and there will be something there that will take your fancy! You can see their price list here. The salon has a really relaxed vibe to it, even though I was a new client all the staff chatted to me as though I had been going there for ages. I love things like that. There's nothing worse than being treated differently because you aren't one of the regulars! Thankfully my hair wasn't too damaged so Katy was happy to use bleach on it, taking a lot of foils she then set to work putting them into my hair. This took some time due to the amount of hair I have! In order to create a natural sunkissed look, she kept the bleached sections of hair very fine. The foils were left in just long enough to create some lovely subtle caramel highlights throughout my hair. 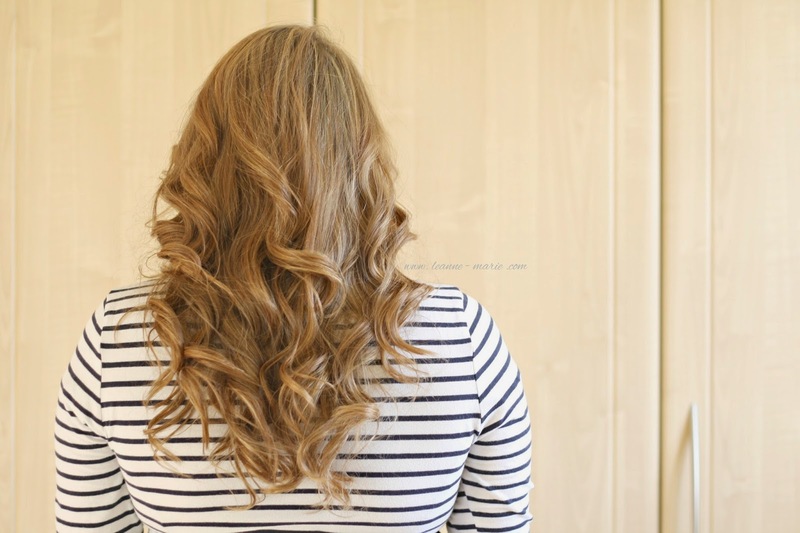 We could have left them in a little longer but I didn't want to go too light too quickly, if I gradually go lighter over a longer period time I hope to keep my hair in good condition while doing so. I fear that if I bleached too much too quickly I'd end up with a head of straw! There are a huge range of products for sale in LKHair, from Redken, Phillip Kingsley & Evo. When washing the foils out Katy used an Evo Fabuloso Caramel conditioner which is a instant colour and nourishing treatment, this was left on my hair for 5 minutes to work it's magic. She followed this with the Redken Diamond oil shampoo and conditioner which deeply moisturises the hair, perfect as I had just had a full head of foils put in! Katy finished off by cutting a little bit of a sweeping fringe in and gave me a lovely smooth blow dry using the new Redken Pillow Proof blow dry extender. Overall I am really pleased with my new hair colour and experience at LK Hair. I posted a couple of snaps of inside the Salon onto my Facebook page so head over there to have a look. LK Hair also have their own page which you can find here. There are some beauty tools that don't get much praise, we use them on a regular basis but because they just blend into the background & we forget to throw them into the spotlight. In this case it's the cotton bud (Or Qtip). I'm sure you've all got a little stash of them in your bathroom. They are the item that I grab in boots when I am on a bit of an essentials shop, along with the toothpaste, shower gel and deodorant. I don't think twice and just grab a box out of habit, but did you know you can use them for many different things, not just cleaning out your ears! + Clean up your manicure : We all go through the 'oh my left hand looks great but I kinda messed up on my right hand' moments. This is where these bad boys come in. Dip them into your nail varnish remover and use them to tidy up the edges of your manicure with ease! + Perfect winged eyeliner : Winged eyeliner is something I am still trying to master, but while I am on this journey to perfection, cotton buds lend a helping hand to shape my wing! Sometimes I draw the line too thick, too far out or completely mess up the perfect point on the end. A cotton bud dipped in moisturiser or miscellar water helps tidy up the flick in sections and leaves me with nearly perfect wings. + Keep dye off your forehead : When I went through a phase of dying my hair at home, I would use a cotton bud to to ensure I didn't get dark dye marks all over my forehead. We cant apply hair dye perfectly and you're bound to have a few little bit of dye along your hair line, use these dipped in warm water as soon as you can and remove the dye. No more tale tale signs that you aren't a natural red head. + Get rid of the blemishes : I'm partial to the odd spot or two, by using cotton buds for precise application of my spot treatment means I can ensure that the product gets to work quickly on the effected area and I don't irritate the 'healthy' skin around the blemish. + Brighten your eyes : We all know I love a bit of highlight. In order to make my eyes really stand out I like to highlight the inner corners, due to the size of cotton buds, they act as the perfect tool to add that pop of shimmer around my inner corner, the plus side is that they are disposable so there's no washing required afterwards! + Exfoliate your lips : Now we are into spring the brighter lip shades are making an appearance that means your lips need to be in tip top condition. I use a Cotton bud to gently exfoliate the lips but running it back and forth across them. Just pop on some lip balm after and I'm ready for my bright lippy! 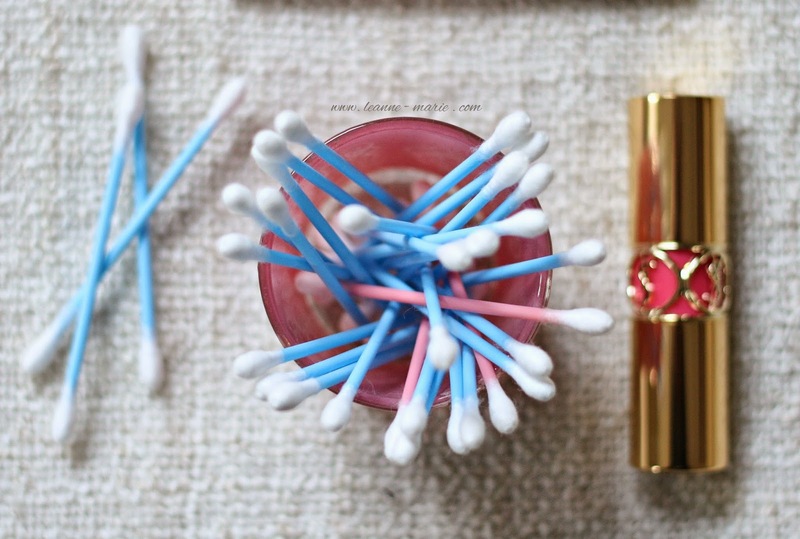 Those are my alternative uses for cotton buds, do you have any you want to add? Leave them in the comments! Tom and I do like our little weekends away. I think it's good to take some time out every so often and go exploring somewhere new. Mini breaks like this are much more doable and affordable compared to going on big week long holidays somewhere hot, so we do them quite often. It's nice to discover new places! 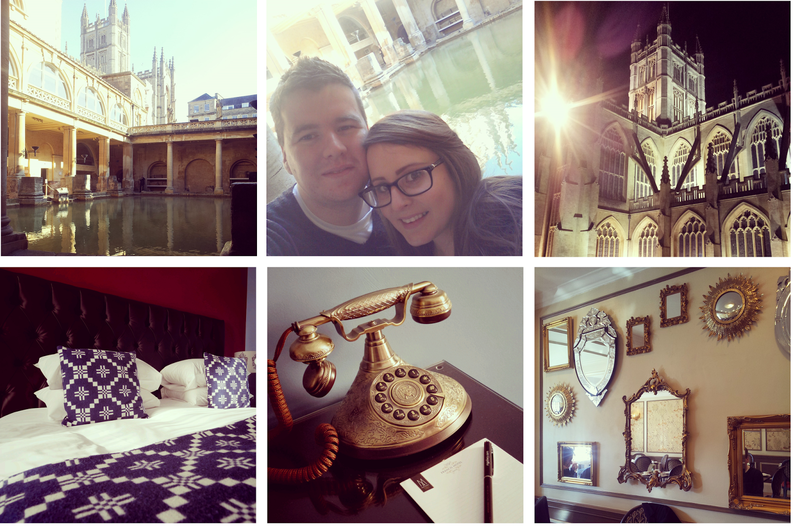 The other weekend we headed along to Bath for a couple of days. We've both briefly visited the city in the past, but they've been more of a flying visit so we didn't get a chance to properly look around. Bath is about an hours drive from where we live so I am surprised it took us this long to actually go along and stay there! Firstly the shopping in bath is really good. You've got a whole range of shops to spend our money in. From the standard highstreet brands to more pricer names like Jo Malone, Reiss and Whistles. You can walk down the main highstreet or take a step down a small cobbled street and find cute vintage boutiques and tea rooms. As I like to say, it would be a nice city to visit if you've got some birthday money to spend! To do a bit of the touristy bits we went along and had a look at Bath Abbey, you can go inside but we chose not to because it was such a lovely day, just seeing the architecture from the outside was enough for us! Following that we headed along to the Roman baths. Something I was really looking forward to seeing. Tom is a bit of a history geek and being with him 7.5 years it has kind of rubbed off on me a little! For £13.50 you get entry into the baths and a audio guide. I've never been one for using audio guides but in this instance I actually enjoyed learning about all the different sections of the baths and the stories behind them. Have you ever been to Bath before? What city's would you recommend we visit next? Like most of you I am sure, there are a few online stores that I find myself checking the 'new in' section on a daily basis, Zara being one of them. The TRF Line always plays host to a great range of items and really affordable prices so you don't feel too bad popping a couple of things in your online basket. 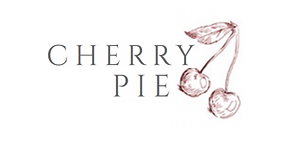 Then when you're feeling a bit flash - or payday has just been; There's the main womenswear line where you can pay a little more for staple items to add to your wardrobe that in the long run, will probably last you a little longer than those from TRF. Don't shoot me, but I think I am a bit bored of seeing Muji storage on every.single.blog. I admit in the past I have had acrylic makeup storage - I bought these drawers from Homebase - Then when we moved into our flat I chose to throw all my beauty bits and bobs into a Malm 6 drawer dresser - See my blog post here. More recently I have found myself selecting a few bits of makeup on rotation each week and putting them on my bedside table ready to use each morning. While this does mean I'm not neglecting too many of my products, it did start to look a bit messy! The other week I popped into TKMAXX - I love that shop! If you are willing to have a good rummage on the shelves you do find some right gems. In this instance it was these two glass trinket boxes. The smaller one was sat inside the bigger meaning they came as a pair... for only £3.99. What an absolute steal! I think they are a great alternative to the muji drawers everyone seems to have. A more sophisticated and grown up version if you will! I keep my daily make up in the larger of the two trinket boxes and use the smaller version to store a variety of lip products I like to switch up throughout the week. I noticed that the store had a variety of different shaped & sized trinket boxes. Some fairly large vertical standing ones, which I am not sure what you would store in, but they definitely would look pretty impressive on your dressing table or in your bathroom. 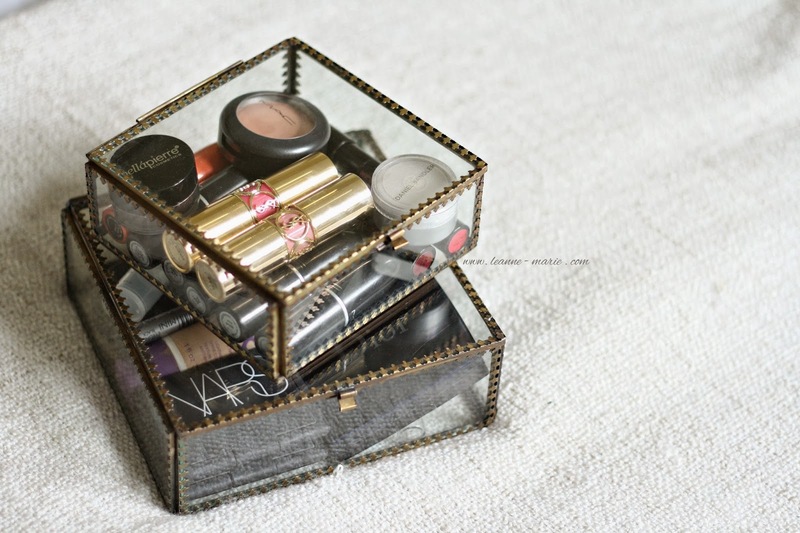 Do you use an alternative form of makeup storage instead of the blogger favourite muji drawers? 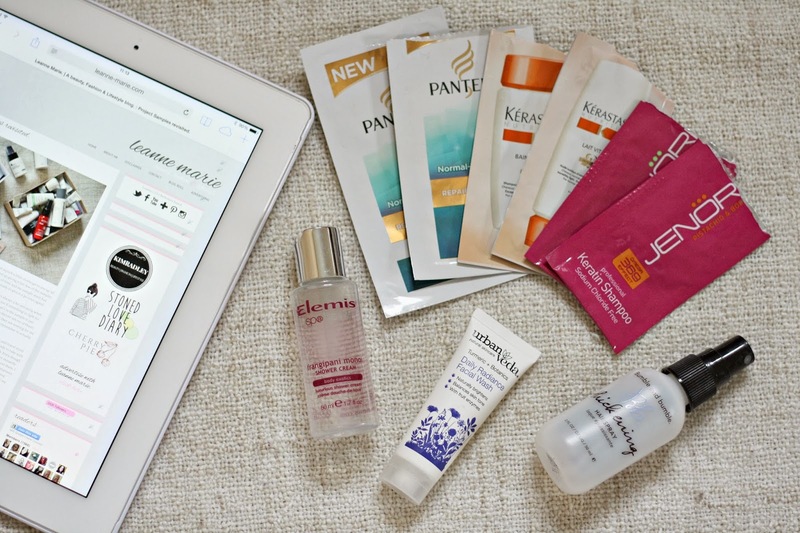 So since I wrote this post I have made a conscious effort to reach into my sample boxes and start to use up some of them! In some cases it was easy to use them. Other times I had to remind myself! Rather than go through each sample individually I thought I would share with you the stand out samples from this particular batch. Obviously there will be hit and misses when you are going through samples of products, you aren't going to love everything you try. Bumble & Bumble Thickening hairspray - This sample came from a magazine. I've been using it for a while now and I have to say since it ran out I have noticed that my hair doesn't seem as 'big' compared to before. I can get away with spraying a fair bit in the roots of my hair without leaving it feeling as though its full of product which is a big plus for me. I do have some other volumising sprays in my stash which I need to finish, however I would seriously consider purchasing this full size. Pantene Repair & Protect Shampoo & Conditioner - Out of the shampoos & conditioners I tried out this range was the one that stood out the most as being products I would go out and purchase full size. The shampoo left my hair feeling really clea, and the sachet actually lasted two washes because I didnt need to use much product. The conditioner left my hair feeling extremely smooth and nourished, brushing through my hair after towel drying was a complete dream! Definitely one I will be getting in boots! Elemis Frangipani Monoi Shower Cream - I really loved this shower cream firstly the scent is absolutely lovely! Give me everything in this range please! The shower cream feels really luxurious. It's not one that really lathers but it does leave my skin feeling very moisturised. It's quite pricey in my opinion for a shower cream so as much as I would like to purchase it full sized, I think it would end up being one of those treat items! I don't really have much to say about the samples that didnt have that 'wow' factor. The urban Veda daily radiance facial wash had a really nice scent however it left my skin feeling very dry which was annoying! Even though I am a fan of some products from this particular keratase range, the shampoo & conditioner didnt do anything for me! Are you doing something similar to this? Working your way through your samples? So after the last few weeks I have treated myself to a couple of items. Nothing groundbreaking or very expensive just a few bits and bobs to add to my wardrobe to mix things up a bit. I mentioned in one of my last outfit posts that I needed some new heeled boots so since then I have been on the hunt for a pair that I like. While wasting some time in town the other day I came across these Tan heeled Chelsea boots in Debenhams Outlet. I was drawn to them because the shade of tan wasn't too orange - I'm sure you all know what I mean. I also loved the scallop detailing on the edges of the elastic part. They aren't too high and are fairly comfortable (even though I bought them a size bigger than I usually take because they didn't have a size 3!) They are from faith and also come in black. If I am able to find them in my size I would be really tempted to get them. Finally, another handbag. You know me I do like my bags. However justification is that I sold a couple of bags on ebay so I've just gone ahead and replaced one of them! ha! This particular bag is from the Zara basics range. Another item I got while in Manchester. It was just on its own in the sale section of Zara but without any form of reduced sticker on. I took it to the till and had one of those great moments when it goes through cheaper than stated on the tag. So in the end I got £6 off the original price. It's a great size for a small day bag but also perfect for a evening out. I do really like the mix of suede and faux leather. So those are a couple of bits that have made their way into my wardrobe in recent weeks! Have you purchased anything nice recently? Let me know in the comments!